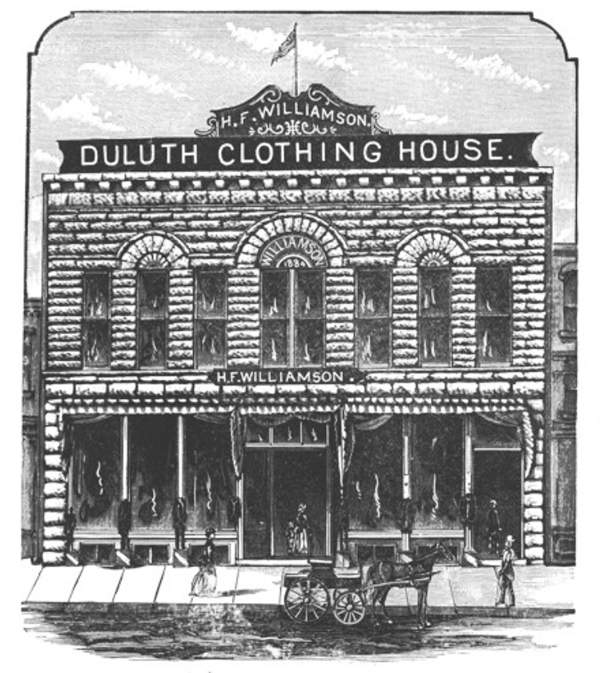 Harvey Williamson Sr. hired George Wirth in 1883 to design a building to house his clothing company. The two-story building was faced in brownstone and featured three arched windows on the second story. Like Fargusson’s first building, Williamson displayed his name prominently across the bottom of the middle window. In 1887 Edward Mendenhall became a partner in the business with Williamson’s son, H. Frank Williamson, and the store operated until 1943 when the Livingston family bought the business. They moved the store to another location in 1948 and other businesses occupied the building, including Allen’s Shoe Store, the Patty Cake Shop, Leed’s Women’s Clothing, and Dworshak’s photo studio. On December 31, 1953, fire of unknown origin quickly spread to all businesses and caused the roof to collapse. The building was demolished and in 1954 two one-story shops replaced the Williamson Block; those two buildings were later combined as one, currently the home of North Shore Mortgage.